You don’t have to live in Italy to take advantage of the award winning closet organizers and walk-in closet shelving systems from Rimadesio. Their various collections of patented closet systems incorporate sliding doors, shelving, and drawer units using today’s most innovative technology. Rimadesio incorporates high style materials to add visual glamour that include etched and satin glass in vivid colors, aluminum accents and hardware, and lacquered and stained woods. The “Atmospheres” collection shown here can be customized to fit any space and may find a home outside the closet as a stunning wall unit or room divider. 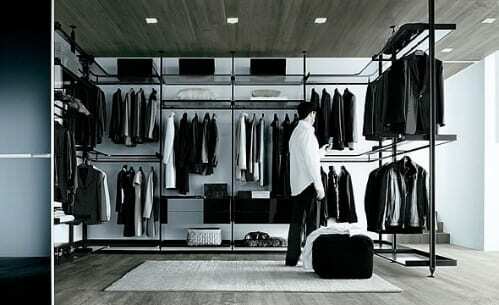 They have a must see collection of modern shelving and bookcases, sliding doors and more closet systems.